Working Out The "Working Out Debate": Do I Need To Exercise? Once upon a time, this might have been an unusual statement to hear. Physical activity has been a staple of weight loss gurus for years. It is practically a no-brainer. A gym membership, running routine, or exercise DVD’s are part of the Weight Loss Starter Kit we all gravitate to when January 1st rolls around and New Years Resolutions begin. Yet, when you visit Keto and Low Carb boards, you may notice a growing trend. Many posters are commenting that they lost a huge number of pounds by eating Low Carb High Fat alone. Exercise may have come in at a later point (often it never has), but it wasn’t a part of their lifestyle change for the first ten, twenty, fifty, or even a hundred pounds lost. By now, it is common knowledge that the Calorie-In, Calorie-Out equation is faulty. Just like “A calorie is a calorie”, we know our bodies just don’t calculate things that way. Running for thirty minutes won’t necessarily burn away the food you ate an hour before. Energy is more complex than that. This fact is sometimes taken to mean that exercise doesn’t matter when it comes to losing weight. An opinion reinforced by the success so many see on a Ketogenic or Low Carb diet without it. You could be excused for assuming that exercise for burning fat is another myth generated by the Calories-In, Calories-Out fallacy. While it is true that you can lose plenty of weight by eating Low Carb High Fat without doing a single sit-up, there is much more to the issue that you might not be considering. 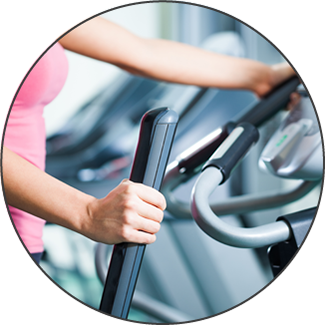 It is very difficult to know exactly how many calories you are burning during any given workout. There are tools to help you estimate, but even with a heart rate monitor you are guessing the ballpark figure. But even though the Calories-In, Calories-Out idea isn’t accurate, and neither is counting the calories you allegedly burn, you are making an impact when you are active. When you eat a diet high in carbohydrates, you are burning glucose as fuel. When you eat Low Carb High Fat, you have no glucose and enter into a ketogenic state. In this state, you are burning fat instead of glucose…and not just the fat you eat. You are burning the fat on your body. Every time you work out you are expending more energy, and so burning more of that fat to fuel the activity. Your results will be enhanced by even small blocks of time spent in an active state. The difference it makes is incredible. Being active is an important part of staying healthy. We all know this, and too often we ignore it. It is easy to put off physical fitness when we haven’t had a health scare to push us into starting. Wouldn’t it be better to begin before that happens? From heart to bone health, moving is something we should all be doing more of. That includes standing up between periods of sitting, as nothing is as bad for us as long hours spent in a chair. Even if the only lifestyle change you make is a short walk at the end of each day, you will be improving your body from the inside. In addition to the above benefits, there are some lesser touted ones that could also change your life. Exercise have been found to reduce depression and anxiety, improve sleep, help manage pain, and even boost confidence. Part of this is the release of endorphins in the brain. They interact with receptors that have a number of positive effects. The perception of pain can be numbed and so better managed in patients dealing with chronic discomfort. A sense of happiness and well being is also experienced, such as in the “runner’s high”. It should be clear by now that exercise really is an important part of every day life, not just for reaching weight loss goals. But how do you get started when you are rusty, or have never worked out? The most important thing to remember is that you don’t have to jump right into the deep end. Any activity will be an improvement, and over time you will gain stamina, and so adjust your exercise routine accordingly. Once upon a time the common advice was to exercise 30 – 60 minutes, 3 times per week. That can be a difficult change to make and stick to right away, and many people immediately say they don’t have the time for it. Now experts are suggesting that people new to this lifestyle begin by exercising ten minutes a day. That may not seem like a lot, but it allows you to build good habits. Fitness becomes a regular part of your day, and slowly you will begin to increase and hone your activities. This ten minutes can be done at home, at the office, outside, or anywhere else. YouTube is full of 10 minute workout videos you can follow. You can go for a short walk or run. Or get a pair of dumbbells and strength train. Whatever you decide, ten minutes a day is an easy commitment to make.